Wolves fans would have preferred the gold and black to have had prominence. 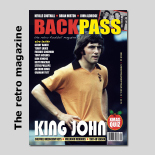 Wolves fans are being offered another invaluable ‘take’ from the inside on the club’s late 1960s resurgence and their thrilling take-off as a major force early in the following decade. As a follow-up to the Dave Wagstaffe and Frank Munro stories that have been published in the last few years, skipper Mike Bailey is now busy putting pen to paper. 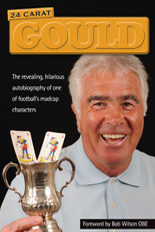 His autobiography, The Valley Wanderer, is due out in time for the Christmas market and takes in his decade at Molineux as well as the years at Charlton and with England that preceded it. Mike has been working on the project for more than a year with his editor Clive Corbett, the author of two substantial previous Wolves books – Those Were The Days and Out of Darkness. His story will stretch to around 250 pages, with eight devoted to photographs, the front and back covers reflecting the fact that he served two clubs before his playing career wound down in America. “The Valley Wanderer’ tells the story of a man who was fiercely competitive on the field, and still is on the golf course, but whose laid-back disposition makes him hugely liked by former team-mates and opponents alike,” says the book’s promotional literature. Bailey joined Wolves a few weeks before England’s 1966 World Cup triumph and, having been named captain within months, remained with them until a third of the way through their Second Division title-winning season under Sammy Chung in 1976-77. 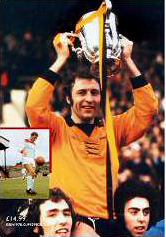 Only 12 men in Molineux history have bettered his tally of 436 League and cup appearances – a span of service that included the lifting of the League Cup in 1974, journeys to two major cup semi-finals and an injury-hit part in the long run to the 1971-72 UEFA Cup final. What is sometimes overlooked is the fact that he also subsequently worked for several years in management and even took Brighton to their highest ever top-flight finish. ….and what’s on the back cover. 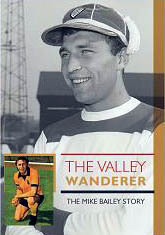 The Valley Wanderer costs £14.99 and is produced by Geoffrey Publications (gpbooks@hotmail.co.uk). Posted on: Saturday, October 10th, 2015.